Switching Horses Midstream The challenge of migrating 150 microservices to Kubernetes Euan Finlay @efinlay24 hi! thank you for the introduction back in 2015, the Content team at the Financial Times were having problems we had been struggling with the stability of our containerised platform our developers were constantly firefighting which was increasing their stress levels, and dropping morale across the team how did we get into that situation? and how did we manage to turn things around, with the help of iQuest? @efinlay24 this - which is only HALF of our service architecture diagram you won't be able to see any detail here, because it's really complex beacause we use a microservice architecutre, our system is made up of around 150+ small services, each with a single responsibility. Running highly available services is complicated. @efinlay24 we need resilience and availability, which means we need multiple copies of the same service, running on different underlying hardware for us, that means around 600 containers, running on a much smaller number of Amazon instances. This is where cluster orchestrators come into play - it's impossible to manage this number of services manually we need automated deployment, scaling, and management of our containerized applications. Spend your innovation tokens wisely. http://mcfunley.com/choose-boring-technology There's a another great blog post from Dan Mckinley from Etsy about how to approach building technology solutions. he describes a limitation on the amount of new and innovative work you can do at any one time he calls this innovation tokens Imagine you have a limited supply of these tokens in your wallet, and you get to choose what you spend them on. Use a brand new database technology - you’re using an innovation token. Choose a new programming language? that's another token we definitely had to spend our tokens to build our own orchestration platform - so why did we do it? For us, the benefits outweighed the risks. @efinlay24 Well, for us, containerisation offered some big advantages compared to our old systems. Before we introduced containers, we were running each service on its own instance, which is a really inefficient use of resources. individual microservices don’t use up much memory or CPU, and the costs quickly add up. 2015 2016 > Tools started maturing. 2017 2018 When we started using containers, we didn’t have a boring alternative to building our own platform. But at the end of 2016, there were people successfully running off-the-shelf cluster orchestrators in production. https://blog.gardeviance.org/2014/03/on-mapping-and-evolution-axis.html Things were moving from custom built to product, and even towards commodity we had to take advantage of these moves. because once something is available as a product, we only want to be building that ourselves if it is absolutely core to our business. We are not a cluster orchestration company. @efinlay24 The FT is not a cluster orchestration company. We’re a digital news organisation. And that’s where we have to focus our innovation, where possible. Metric for success #1: Reduce the amount of time spent keeping production healthy. @efinlay24 We agreed two metrics in the workshop the first one was to reduce the amount of time spent supporting the platform. When things went wrong in the internals of our stack, it was often hard to diagnose the problem and fix it worse, there was no-one else we could escalate the problem to. and, the second metric is amusing, but totally serious. @efinlay24 we were all really fed up with the number of production incidents worse, people in other areas of the business were starting to comment on the number of problems we were having as well. We chose Kubernetes. @efinlay24 After a few days evaluating our options, we picked Kubernetes. We preferred it to the alternatives that we assessed, and it fit all our requirements. We also liked that multiple cloud providers were starting to support k8s, and we were hoping it would become an emerging standard. Switching horses midstream image? even though we had good reasons to migrate, it was still a major challenge… we don’t really want to switch horses midstream. we've got enough other projects going on. Lots of other work going on at the same time @efinlay24 this is a map between the different work streams we had back in 2017 like before, I'm not expecting you to see the detail - and this is actually only a 1/3rd of the full diagram This was extremely complex. And our migration team had to make sure they didn't impact any of this. During our parallel run, there were over 2000 code releases. @efinlay24 We also had to be careful that for our developers could keep working normally. for example, if we had made a change that added just 10 minutes to each deployment over the course of 2000 releases that works out to 47 working days so what was actually involved in the migration process? Unfortunately, we discovered a lot of broken things... @efinlay24 and in reality - it took a lot longer than 30 minutes to make those changes, deploy in parallel, and then test There were several reasons for this. Nightly builds can help, even if you don’t deploy them. @efinlay24 other teams at the FT build all their services every night - which means you pick up the build problems as they arrive. This is worth doing, because you don’t want to have to resolve lots of build problems in order to get a critical bug or security fix out to production. We should have swarmed on the work for longer. @efinlay24 with hindsight, if we were to do things differently, the single biggest change would have been for everyone to swarm on the work from the beginning - not just a few days We paid a price for the size of the migration team - it was small, because we hadn’t agreed as much funding for this project as we would have liked. Running in parallel increased our release overheads. @efinlay24 in addition, running in parallel for several months brought its own challenges The longer we ran, the longer we had to release code to two stacks, then test against two stacks. ...and also increased our AWS costs. @efinlay24 It increased our monthly AWS bills as well - which was fine for a short duration, but we had to make sure that we communicated why our costs increased, to the people who needed to know our costs would have been even higher if we hadn't turned off parts of our old platform in order to save money. Our iQuest colleagues were essential to making this successful. Thank you, Tommy and Sorin. :) @efinlay24 I have a huge amount of respect for the two iQuest engineers who were fully committed to the k8s implementation and migration - it was really tough on them Without their dedication to the project, and a lot of hard work on their part, none of this would have been possible they built the infrastructure and the pipelines that were required and after that, they got stuck in and spent months migrating service after service It’s extremely hard to stay motivated in those circumstances. They did, and we're very grateful to them for that. 2015 2016 2017 2018 > Kubernetes go-live. Finally, though - our goal was in sight. We switched over just before a key part of our old stack became end of life. The last few months were intense, and swarming all of our teams onto the project had an impact on other work we were trying to do. But we made it. Was it worth it? @efinlay24 So did we get the results we were looking for? We think so. We have a far more stable platform. @efinlay24 We have a considerably more stable platform. In the month following k8s go-live, we had 3 production incidents - vs 13 in the same time period in 2017. We’ve also had far fewer out of hours platform incidents and in some cases, k8s actually recovered before the we logged on to our laptops. We can learn from others. And we can share our knowledge. @efinlay24 We now use a technology that we can google about. We can watch talks, discuss our problems with other companies. Send people on training. @efinlay24 and yes - we managed to reduce our costs. compared to our old containerised stack, we achieved a further 35% reduction in hosting and support costs And even with the cost of the migration, we predict we'll break even in 3 years compared to our old stack. @efinlay24 That was our journey - we didn’t start from the easiest place. And we didn’t necessarily end up exactly where we expected, either - but that's ok. we have to keep asking ourselves - is this a good place to stop, or do we need to go further? We learnt a lot along the way. and we now have a stable, cheaper platform our teams are much happier as well - they're able to spend their time on building new functionality, rather than supporting our platform. 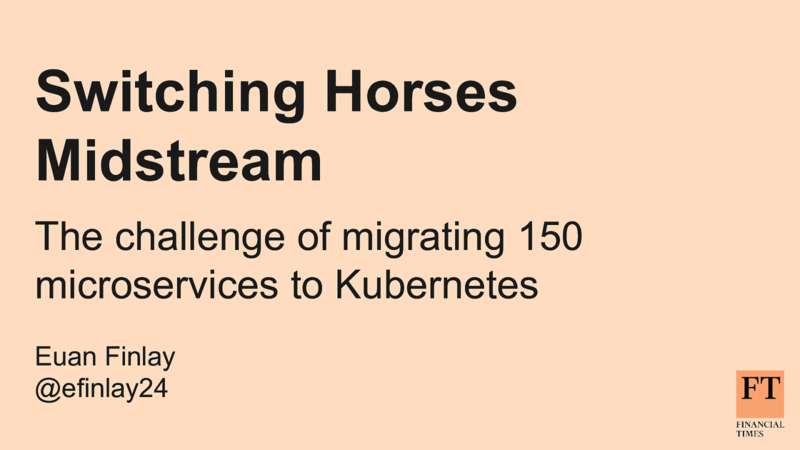 View Switching Horses Midstream: The challenge of migrating 150 microservices to Kubernetes on Notist. The FT’s content platform team put our first containers live in mid-2015 and migrated the rest of our services over by April 2016. At that point, we weren't using Kubernetes - and much of what we were using, we built ourselves. At the end of 2016, we decided we wanted to benefit from the work other people were doing and switch over to Kubernetes. But it's not easy to do that kind of move when you have 150+ microservices and you need to keep the existing platform running in parallel while you do the migration.